Map of the frequency with which people in different places @reply to each other on Twitter. The brightness of each arc is proportional to the log of the number of tweets from one place addressing someone in another place, with locations chunked to 20-mile squares. Communication is shown moving clockwise from the person sending the tweet to the person being addressed. 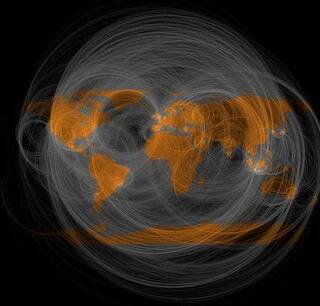 Data from Twitter streaming API, May 15 through October 10, 2011. World map outline from Natural Earth.